On the subject of Syd Barrett, the original guitarist, lead vocalist, and songwriter of Pink Floyd, there have been reams of books written, theories postulated and accounts (both true and false) to feed the myth of the man. 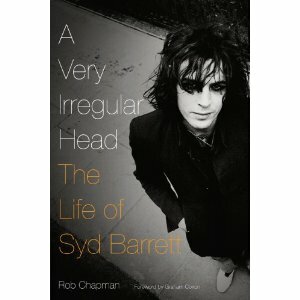 In a new book, A Very Irregular Head: The Life of Syd Barrett, Rob Chapman discusses and diffuses the misconceptions of the enigmatic, original leader of Pink Floyd, the man many consider to be one of the most important British pop songwriters of his time. As a contributor to Britain’s preeminent music mags, Mojo and Uncut, Chapman’s research is, of course, precise. However, this 400-page book isn’t simply a fact-filled journey through Barrett’s life. What Chapman executes, without genuflecting, is the actual feel of the times, with a brief biography of Barrett (born Roger Keith), discussing his deep passion for his painting studies, his first attempts at playing guitar and songwriting, building the mid-60’s psychedelia scene with Floyd and then the man’s slow descent into troubled times of the mind. Chapman provides a good read on Barrett’s solo work, and ends the book with a very poignant chapter on Barrett’s life when he returned to Cambridge to paint and tend to his garden. What I especially liked about Chapman’s reporting is that he avoided theorizing and basically upended the supposed stories of the ex-Floyd leader’s seemingly wacky behavior. A Very Irregular Head: The Life of Syd Barrett is a great read; it’s the not-so-simple, but honest story of a shining talent who dimmed a little too early for his fans’ tastes, but probably not his own.